With technology from Database Systems Corp., you can broadcast alert and warning messages to hundreds of thousands of households warning of potential catastrophic disasters, including severe weather warnings. Businesses, organizations and emergency response teams can be notified quickly whenever a disaster hits an area. Pre-recorded warning messages can be played giving households travel warnings advising them where to seek shelter or providing other safety instructions. You can send a broadcast alert warning to specific neighborhoods or communities in the event of a wildfire or severe weather warnings. Community alarms can be directed to operators that are standing by to handle special individual emergencies. Messages can also be broadcast seeking volunteers or special assistance from emergency personnel. For more details on this emergency notification and telephone warning service, visit our 911 Broadcast (www.emergency-broadcasting.com) webpage. Remote communities have used this technology to warn residents when the forest service planned a controlled burn, preventing a rash of 911 and emergency calls by concerned citizens. Other applications include warning residents when there is a toxic chemical spill or other dangerous environmental disaster. The Adams County Memorial Hospital is an 86 bed, acute care facility located in Decatur, Indiana. The hospital, which is county owned and operated, was dedicated as a memorial to the Veterans of World War I in July 1923. ACMH has been in continuous operation since its dedication. The hospital utilizes our voice broadcasting system with touch phone response to notify its employees and staff of emergency situations. When individuals are contacted, they are required to acknowledge the call through touch phone responses. If an answering machine is detected, a detailed message is left on the machine. Amber Charter School provides a comprehensive learning experience for students. Amber Charter School currently utilizes Emergency Voice Broadcasting to notify school members and faculty in the event of any emergency that may arise including school closings, severe weather, or catastrophes. Arnall Golden Gregory, LLP is an Atlanta law firm that serves the business transaction needs of growing public and private companies. Arnall Golden Gregory, LLP currently utilizes Emergency Voice Broadcasting to notify employees of upcoming events and emergencies. Bayer MaterialScience AG, a subsidiary or Bayer aspirin, is one of the world's largest producers of polymers and high-performance plastics. Bayer Polymers is currently utilizing Voice Broadcasting in order to notify all employees in case of an emergency as well as a reminder service for upcoming company events. Bernards Township Schools provide a comprehensive learning experience for all students. Bernards Township Schools currently utilize Emergency Alert Voice Broadcasting to notify school members and faculty in the event of any emergency that may arise including school closings, severe weather, or catastrophes. Bronxville Public Schools currently utilize emergency voice broadcasting to deliver urgent messages to school members and faculty. These messages provide information regarding school closings, severe weather, and emergencies. Castle Access, provides businesses with an array of off-site services including; environmentally controlled data centers that offer high-speed, managed Internet access, built-in network redundancy, and the highest standards of 24/7 customer support and technical service. Castle Access currently utilizes Emergency Voice Broadcasting to contact their clients regarding system updates, notices and emergencies. The Connecticut Council of Police Unions is a comprehensive network of communications and resources that provides new and important information to all its union members. The Connecticut Council of Police Unions is currently utilizing an 8-line analog Voice Broadcasting system in order to notify its union members of upcoming events and emergencies. Located in central Oregon, Crook County has an approximate population well over 16,000 people. Major cities such as Portland, Salem, Corvallis and Eugene are located within a three-hour radius of Crook County. Crook County currently utilizes Emergency Voice Broadcasting to contact city employees and citizens in case of an emergency. Consumer Power Line is a New York based company that helps clients reduce energy and operating costs. Consumer Power Line currently utilizes DSC's 911 emergency voice broadcasting to send emergency messages to company technicians. A real-time monitoring environment allows CPL to review call status. Douglas Elliman Property Management is a residential real estate management firm located in the New York Metropolitan area. Elliman Properties provide expert management of co-op, condominium and rental properties throughout the five boroughs, Long Island, Westchester County and Northern New Jersey. Elliman Properties currently utilize Emergency Voice Broadcasting to notify tenants in case of an emergency and details of upcoming events. EnerNOC is a leading provider of full-service demand response and energy management solutions to commercial and industrial customers in the United States. EnerNOC currently utilizes Emergency Voice Broadcasting to notify users regarding reducing their demand for electricity during peak time periods or supply shortfalls. To insure accuracy, each user is prompted to confirm receipt of the message by touch tone response. Church customer that has an emergency response plan using our voice broadcasting system. The initial "call out" notifies all of the churches of a disaster or emergency. Mac Management Co., Inc is a consulting and management firm based out of Chicago, Illinois. Mac Management currently utilizes Voice Broadcasting to notify employees of emergencies or upcoming events. Moore Capital Management, LLC is a private management firm based out of New York, NY. Moore Capital Management, LLC currently utilizes Emergency Voice Broadcasting to notify employees of emergencies and upcoming events. 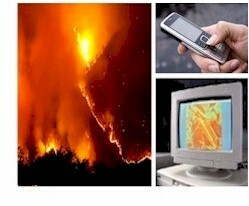 Voice broadcast messages to notify residents when forest service controlled burns are to take place. Calls indicate when resident should evacuate the area, where they can stay, etc. Voice broadcast messages to notify school members and faculty in the event of any emergency that may arise including school closings, severe weather, or catastrophes. Sara Lee Corporation is a global manufacturer and marketer of high-quality, brand name products for consumers throughout the world. Sara Lee � Newbern facility, currently utilizes Emergency Voice Broadcasting to notify employees of upcoming events and emergencies. Seattle Center is one of the nation's most extraordinary urban parks and entertainment centers, with over 10 million visitors a year. Seattle Center utilizes DSC's Emergency Notification Services to broadcast important information concerning event servicing and operations. ENS allows the Seattle Center to contact over 60 key employees simultaneously in case of an emergency. A charter school that emphasizes the use of time and technology, parental involvement, and character education in developing their children�s future. Grades: K-8. Seven Hills utilizes our Emergency Voice Broadcasting system to call parents and faculty members for alert notifications. St. Joseph's Medical Center is a 162-bed not-for-profit hospital located in Brainerd Minnesota. Nearly 900 employees and more than 80 physicians representing 20 specialties make St. Joseph's the largest hospital in north central Minnesota. St. Joseph�s utilizes Voice Broadcasting to notify employees in case of an emergency as well as a corporate event reminder service. Established in 1965, Temple Ahavat Shalom reflects the spirit of its congregants who are sensitive, caring people, eager to join in building a community dedicated to celebrating Judaism and celebrating life in all its richness. Temple Ahavat Shalom currently utilizes Emergency Voice Broadcasting to notify members regarding upcoming events and emergencies. Located in the San Joaquin Valley of Central California, the Tulare Joint Union High School District serves over 4,000 students in grades 9 through 12 and over 2,000 in the Tulare Adult School. Tulare utilizes Voice Broadcasting to deliver informational messages to students. Located in Santa Barbara, California with 450 students Vieja Valley School utilizes Voice Broadcast messaging to notify school members and faculty in the event of any emergency that may arise including school closings, severe weather, or catastrophes. The Westchester Corporation is a homeowners association based in Washington, DC. The Westchester Corporation is currently utilizing Emergency Voice Broadcasting to notify members of upcoming events, meetings, and any urgent information.